This article is about the historical figure. For the film, see Johnny Appleseed (film). 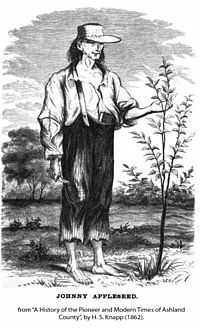 John Chapman (September 26, 1774 – March 18, 1845), better known as Johnny Appleseed, was an American pioneer nurseryman who introduced apple trees to large parts of Pennsylvania, Ontario, Ohio, Indiana, and Illinois, as well as the northern counties of present-day West Virginia. He became an American legend while still alive, due to his kind, generous ways, his leadership in conservation, and the symbolic importance he attributed to apples. He was also a missionary for The New Church (Swedenborgian) and the inspiration for many museums and historical sites such as the Johnny Appleseed Museum in Urbana, Ohio, and the Johnny Appleseed Heritage Center in Ashland County, Ohio. [A] The Fort Wayne TinCaps, a minor league baseball team in Fort Wayne, Indiana, where Chapman spent his final years, is named in his honor. Chapman was born on 26 September 1774, in Leominster, Massachusetts, the second child of Nathaniel and Elizabeth Chapman (née Simonds, married February 8, 1770). 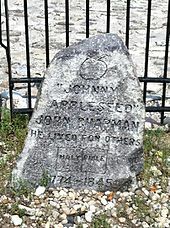 His birthplace has a granite marker, and the street is called Johnny Appleseed Lane. Chapman's mother, Elizabeth, died in 1776 shortly after giving birth to a second son, Nathaniel Jr., who died a few days later. His father, Nathaniel, who was in the military, returned in 1780 to Longmeadow, Massachusetts where, in the summer of 1780, he married Lucy Cooley. According to some accounts, an 18-year-old John persuaded his 11-year-old brother Nathaniel Cooley Chapman to go west with him in 1792. The duo apparently lived a nomadic life until their father brought his large family west in 1805 and met up with them in Ohio. The younger Nathaniel decided to stay and help their father farm the land. Shortly after the brothers parted ways, John began his apprenticeship as an orchardist under a Mr. Crawford, who had apple orchards, thus inspiring his life's journey of planting apple trees. There are stories of Johnny Appleseed practicing his nurseryman craft in the area of Wilkes-Barre, Pennsylvania, and of picking seeds from the pomace at Potomac cider mills in the late 1790s. Another story has Chapman living in Pittsburgh on Grant's Hill in 1794 at the time of the Whiskey Rebellion. The popular image is of Johnny Appleseed spreading apple seeds randomly everywhere he went. In fact, he planted nurseries rather than orchards, built fences around them to protect them from livestock, left the nurseries in the care of a neighbor who sold trees on shares, and returned every year or two to tend the nursery. He planted his first nursery on the bank of Brokenstraw Creek, south of Warren, Pennsylvania. Next, he seems to have moved to Venango County, along the shore of French Creek, but many of these nurseries were in the Mohican area of north-central Ohio. This area included the towns of Mansfield, Lisbon, Lucas, Perrysville, and Loudonville. According to Harper's New Monthly Magazine, toward the end of his career he was present when an itinerant missionary was exhorting an open-air congregation in Mansfield, Ohio. The sermon was long and severe on the topic of extravagance, because the pioneers were buying such indulgences as calico and imported tea. "Where now is there a man who, like the primitive Christians, is traveling to heaven barefooted and clad in coarse raiment?" the preacher repeatedly asked until Johnny Appleseed, his endurance worn out, walked up to the preacher, put his bare foot on the stump that had served as a podium, and said, "Here's your primitive Christian!" The flummoxed sermonizer dismissed the congregation. He preached the gospel as he traveled, and during his travels he converted many Native Americans, whom he admired. The Native Americans regarded him as someone who had been touched by the Great Spirit, and even hostile tribes left him strictly alone. In a story collected by Eric Braun, he had a pet wolf that had started following him after he healed its injured leg. More controversially, he also planted dogfennel during his travels, believing that it was a useful medicinal herb. It is now regarded as a noxious, invasive weed. According to another story, he heard that a horse was to be put down, so he bought the horse, bought a few grassy acres nearby, and turned it out to recover. When it did, he gave the horse to someone needy, exacting a promise to treat it humanely. During his later life, he was a vegetarian. He never married. He thought he would find his soulmate in heaven if she did not appear to him on earth. In Fort Wayne, on Tuesday, 18th, inst John Chapman, commonly known by the name of Johnny Appleseed, about 70 years of age. Many of our citizens will remember this eccentric individual, as he sauntered through town eating his dry rusk and cold meat, and freely conversing on the mysteries of his religious faith. He was a devoted follower of Emanuel Swedenborg, and notwithstanding his apparent poverty, was reputed to be in good circumstances. On the same day in this neighborhood, at an advanced age, Mr. John Chapman (better known as Johnny Appleseed). The deceased was well known through this region by his eccentricity, and the strange garb he usually wore. He followed the occupation of a nurseryman, and has been a regular visitor here upwards of 10 years. He was a native of Pennsylvania we understand but his home—if home he had—for some years past was in the neighborhood of Cleveland, where he has relatives living. He is supposed to have considerable property, yet denied himself almost the common necessities of life—not so much perhaps for avarice as from his peculiar notions on religious subjects. He was a follower of Swedenborg and devoutly believed that the more he endured in this world the less he would have to suffer and the greater would be his happiness hereafter—he submitted to every privation with cheerfulness and content, believing that in so doing he was securing snug quarters hereafter. In the most inclement weather he might be seen barefooted and almost naked except when he chanced to pick up articles of old clothing. Notwithstanding the privations and exposure he endured, he lived to an extreme old age, not less than 80 years at the time of his death—though no person would have judged from his appearance that he was 60. "He always carried with him some work on the doctrines of Swedenborg with which he was perfectly familiar, and would readily converse and argue on his tenets, using much shrewdness and penetration. Steven Fortriede, director of the Allen County Public Library (ACPL) and author of the 1978 Johnny Appleseed, believes that another gravesite is the correct site, in Johnny Appleseed Park in Fort Wayne,. Johnny Appleseed Park is a Fort Wayne city park that adjoins Archer Park, an Allen County park. Archer Park is the site of John Chapman's grave marker and used to be a part of the Archer family farm. The Worth family attended First Baptist Church in Fort Wayne, according to records at ACPL, which has one of the nation's top genealogy collections. According to an 1858 interview with Richard Worth Jr., Chapman was buried "respectably" in the Archer cemetery, and Fortriede believes that use of the term "respectably" indicates that Chapman was buried in the hallowed ground of Archer cemetery instead of near the cabin where he died. The historical account of his death and burial by the Worths and their neighbors, the Pettits, Goinges, Porters, Notestems, Parkers, Beckets, Whitesides, Pechons, Hatfields, Parrants, Ballards, Randsells, and the Archers in David Archer's private burial grounds is substantially correct. The grave, more especially the common head-boards used in those days, have long since decayed and become entirely obliterated, and at this time I do not think that any person could with any degree of certainty come within fifty feet of pointing out the location of his grave. Suffice it to say that he has been gathered in with his neighbors and friends, as I have enumerated, for the majority of them lie in David Archer's graveyard with him. The Johnny Appleseed Commission Council of the City of Fort Wayne reported, "[A]s a part of the celebration of Indiana's 100th birthday in 1916 an iron fence was placed in the Archer graveyard by the Horticulture Society of Indiana setting off the grave of Johnny Appleseed. At that time, there were men living who had attended the funeral of Johnny Appleseed. Direct and accurate evidence was available then. There was little or no reason for them to make a mistake about the location of this grave. They located the grave in the Archer burying ground." Johnny Appleseed left an estate of over 1,200 acres (490 ha) of valuable nurseries to his sister. He also owned four plots in Allen County, Indiana, including a nursery in Milan Township with 15,000 trees, and two plots in Mount Vernon, Ohio. He bought the southwest quarter (160 acres) of section 26, Mohican Township, Ashland County, Ohio, but he did not record the deed and lost the property. Fort Wayne, Indiana, is the location of Johnny Appleseed's death. A memorial in Fort Wayne's Swinney Park purports to honor him but not to mark his grave. In Fort Wayne, since 1975, the Johnny Appleseed Festival has been held the third full weekend in September in Johnny Appleseed Park and Archer Park. Musicians, demonstrators, and vendors dress in early-19th-century attire and offer food and beverages that would have been available then. In 2008 the Fort Wayne Wizards, a minor league baseball club, changed their name to the Fort Wayne TinCaps. The first season with the new name was in 2009. That same year the Tincaps won their only league championship. The name "Tincaps" is a reference to the tin hat (or pot) Johnny Appleseed is said to have worn. Their team mascot is also named "Johnny." A memorial in Spring Grove Cemetery in Cincinnati, Ohio is on the summit of the grounds in Section 134. A circular garden surrounds a large stone upon which a bronze statue of Chapman stands, face looking skywards, holding an apple seedling tree in one hand and a book in the other. A bronze cenotaph identifies him as Johnny Appleseed with a brief biography and eulogy. March 11 and September 26 are sometimes celebrated as Johnny Appleseed Day. The September date is Appleseed's acknowledged birthdate, but the March date is sometimes preferred because it is during planting season. Johnny Appleseed Elementary School is a public school in Leominster, Massachusetts, his birthplace. Mansfield, Ohio, one of Appleseed's stops in his peregrinations, was home to Johnny Appleseed Middle School until it closed in 1989. A large terracotta sculpture of Johnny Appleseed, created by Viktor Schreckengost, decorates the front of the Lakewood High School Civic Auditorium in Lakewood, Ohio. Although the local board of education deemed Appleseed too "eccentric" a figure to grace the front of the building, renaming the sculpture simply "Early Settler," students, teachers, and parents alike still call the sculpture by its intended name: "Johnny Appleseed." Urbana University, in Urbana, Ohio, maintains one of two Johnny Appleseed Museums in the world, which is open to the public. The Johnny Appleseed Educational Center and Museum hosts a number of artifacts, including a tree that is believed to have been planted by Johnny Appleseed. They also provide a number of services for research, including a national registry of Johnny Appleseed's relatives. In 2011 the museum was renovated and updated. The educational center and museum was founded on the belief that those who have the opportunity to study the life of Johnny Appleseed will share his appreciation of education, our country, the environment, peace, moral integrity and leadership. Oooooh, the Lord is good to me, and so I thank the Lord, for giving me the things I need, the sun and the rain and the appleseed. The Lord is good to me. Amen, Amen, Amen, Amen, Amen. Many books and films have been based on the life of Johnny Appleseed. One notable account is from the first chapter of The Botany of Desire: A Plant's-Eye View of the World by Michael Pollan. Pollan states that since Johnny Appleseed was against grafting, his apples were not of an edible variety and could be used only for cider: "Really, what Johnny Appleseed was doing and the reason he was welcome in every cabin in Ohio and Indiana was he was bringing the gift of alcohol to the frontier. He was our American Dionysus." One of the more successful films was Melody Time, the animated 1948 film from Walt Disney Studios featuring Dennis Day. The Legend of Johnny Appleseed, a 19-minute segment, tells the story of an apple farmer who sees others going west, wistfully wishing he was not tied down by his orchard, until an angel appears, singing an apple song, setting Johnny on a mission. When he treats a skunk kindly, all animals everywhere thereafter trust him. The cartoon featured lively tunes, and a childlike simplicity of message. This animated short was included in Disney's American Legends, a compilation of four animated shorts. Supposedly, the only surviving tree planted by Johnny Appleseed is on the farm of Richard and Phyllis Algeo of Nova, Ohio. Some marketers claim it is a Rambo, more than a century before John Chapman was born. Some even make the claim that the Rambo was "Johnny Appleseed's favorite variety", ignoring that he had religious objections to grafting and preferred wild apples to all named varieties. It appears most nurseries are calling the tree the "Johnny Appleseed" variety, rather than a Rambo. Unlike the mid-summer Rambo, the Johnny Appleseed variety ripens in September and is a baking-applesauce variety similar to an Albemarle Pippin. Nurseries offer the Johnny Appleseed tree as an immature apple tree for planting, with scions from the Algeo stock grafted on them. Orchardists do not appear to be marketing the fruit of this tree. References to Johnny Appleseed abound in popular culture. He appears in Neil Gaiman's American Gods as a friend of Algonquin trickster Whiskey Jack (Wisakedjak). Rock bands NOFX, Guided by Voices, and Joe Strummer and the Mescaleros have all released songs titled "Johnny Appleseed", as have Grammy-winning American pastoral duo Eric Tingstad and Nancy Rumbel. "Johnny Appleseed" also featured in a comic series in The Victor in the UK in the early sixties. In Philip Roth's novel American Pastoral, the central character imagines himself as Johnny Appleseed when he moves from Newark to a rural community; in this case the figure stands for an innocent, childlike version of the American pioneer spirit. The Japanese role-playing game Wild Arms 5 mentions Johnny Appleseed as a central figure in the plotline. Apple Inc. uses a "Johnny Appleseed" character as a placeholder name in many of its recent advertisements, video tutorials, and keynote presentation examples; this was also the alias of Mike Markkula under which he published several programs for the Apple II. "John Appleseed" also appears as a contact in many of Apple, inc.'s application demonstrations. The name appears on the caller ID, as a sender in "mail" application demonstrations and screenshots and also in the icons of the "TextEdit" and "Logic Pro X" application. Shelley Duvall's Tall Tales & Legends featured Johnny Appleseed, as played by Martin Short, in 1986. Also featuring Rob Reiner as Jack Smith and Molly Ringwald as his niece Jenny, the story—while entertaining—takes considerable liberties with the original tall tale. Robert A. Heinlein's science fiction novel Farmer in the Sky, which depicts future colonists on Ganymede and takes up consciously many of the themes of the 19th-century American frontier and homesteading, also includes a character who is known as "Johnny Appleseed" and, like the historical one, is involved in planting and spreading apple trees. John Clute's science fiction novel Appleseed (2001) centers on a character who may (or may not) be the immortal John Chapman. John Chapman and his brother Nathaniel are characters in Alice Hoffman's novel The Red Garden. They appear in the chapter "Eight Nights of Love"—passing through the small town of Blackwell, where they plant an orchard but also the Tree of Life in the center of said town, a tree said to bloom and bear fruit in midwinter. In Hoffman's book, John has a brief relationship with a young woman called Minette Jacob, who was about to hang herself after having lost her husband, child, mother, and sister, but who regains the joy of life after meeting the brothers. In the beginning of the chapter the author hints that John was reading Swedenborg's pamphlets, and later in the novel, the characters actually refer to him as Johnny Appleseed. The residents call the variety of apples "Blackwell Look-No-Further." ^ Between Lucas, and Mifflin, Ohio. ^ a b c "John Chapman". Swedenborg.org. Archived from the original on May 17, 2015. Retrieved June 6, 2015. ^ "Johnny Appleseed Education Center & Museum". Urbana.edu. Retrieved June 6, 2015. ^ "The Johnny Appleseed Outdoor Drama". Archived from the original on November 28, 1999. Retrieved September 5, 2006. ^ "Scout.com: Fort Wayne no longer the Wizards". www.scout.com. Retrieved June 7, 2017. ^ Means, Howard (2011). Johnny Appleseed: The Man, the Myth, the American Story. New York: Simon & Schuster. p. 19. ISBN 1439178259. ^ "The Next Page: A People's History of Pittsburgh (Selected shorts)". Pittsburgh Post-Gazette. ^ "John Chapman". Pabook.libraries.psu.edu. Archived from the original on May 6, 2015. Retrieved June 6, 2015. ^ "Johnny Appleseed: A Pioneer Hero,". Harper's New Monthly Magazine. No. XLIII. 1871. pp. 830–831. Retrieved October 8, 2018. . Full text of "Johnny Appleseed: a pioneer hero" at the Internet Archive. ^ Kacirk, Jeffrey (1997). Forgotten English. New York: William Morrow & Co. ISBN 0-688-15018-7. ^ Howe, Henry (1903). Richland County. Howe's Historical Collections of Ohio (485), New York:Dover. ^ Braun, Eric (August 28, 2014). Johnny Appleseed Planted Trees Across the Land. Dustin Burkes-Larranaga (Illustrator). Capstone Press. ISBN 9781479554454. ^ a b "Johnny Appleseed: A Pioneer Hero". Harper's New Monthly Magazine (XLIII): 835. 1871. ^ Hillis, Newell Dwight (1917). The Quest of John Chapman: The Story of a Forgotten Hero. The Macmillan Company. p. 308. ISBN 1481996614. ^ Silverman, Ray (2012). The Core of Johnny Appleseed: The Unknown Story of a Spiritual Trailblazer. Pennsylvania: Swedenborg Foundation Press. p. 73. ASIN B011MFBNRK. ISBN 978-0-87785-345-9. ^ "Obituaries". The Fort Wayne Sentinel. 67 (81). March 22, 1845. ^ a b c d Kilbane, Kevin (September 18, 2003). "Researcher finds slice of Johnny Appleseed's life that may prove his burial spot". The News-Sentinel. Archived from the original on October 19, 2003. Retrieved September 8, 2006. ^ "Man and Myth" (PDF). Archived from the original (PDF) on September 5, 2006. Retrieved August 18, 2006. ^ "The Straight Dope: What's the story with Johnny Appleseed?". Straightdope.com. Retrieved June 6, 2015. ^ "The John Chapman, Johnny Appleseed, memorial was erected in his memory and is in Swinney Park". Contentdm.acpl.lib.in.us. Retrieved June 6, 2015. ^ "Johnny Appleseed Festival". Johnnyappleseedfest.com. Retrieved June 6, 2015. ^ "5 cent Johnny Appleseeed stamp" (JPEG) (Image). Retrieved October 18, 2017 – via Pinterest. ^ "Johnny Appleseed". Archived from the original on February 2, 2008. Retrieved January 2, 2008. ^ "National Apple Museum". nationalapplemuseum.com. ^ Mae Beringer. "The Memory of Johnny Appleseed Lives On". Cornell University. ^ A search on "Subject: Johnny Appleseed" in category books at Amazon.com, September 5, 2007, shows 116 items. ^ Pollan, Michael (2001). The Botany of Desire: A Plant's-Eye View of the World. Random House. ISBN 0-375-50129-0. Retrieved March 11, 2014. ^ "Author Michael Pollan Talks About the History of the Apple". Morning Edition (NPR). ^ "My Name Is Johnny Appleseed". Americantowns.com. Retrieved June 6, 2015. ^ planktonrules (May 27, 1948). "The Legend of Johnny Appleseed (1948)". IMDb. ^ "Kootenai National Forest - Home" (PDF). Fs.fed.us. Retrieved June 6, 2015. ^ "Virginia Apple Growers Association". Virginiaapples.org. Retrieved June 6, 2015. ^ Gaiman, Neil (2001). American Gods. New York: William Morrow. ISBN 0-380-97365-0. ^ Eric Tingstad & Nancy Rumbel (October 25, 1990). Legends (Audio CD). Narada. ASIN B000005OXY. ^ "Exactly what it says on the Text Edit icon." Macformat.co.uk. October 30, 2007. Archived from the original on November 9, 2007. Retrieved December 10, 2007. ^ Apple Confidential 2.0: The Definitive History of the World's Most Colorful Company, Page 4, ISBN 1-59327-010-0. William Kerrigan, Johnny Appleseed and the American Orchard: A Cultural History. Baltimore, MD: johns Hopkins University Press, 2012. "Johnny Appleseed: A Pioneer Hero" from Harper's Magazine, November 1871. "Johnny Appleseed Trail in North Central MA"
Donald Greyfield (January 1, 2001). "John 'Johnny Appleseed' Chapman". Folk Hero and Patriot. Find a Grave. Retrieved August 18, 2011. This page is based on the Wikipedia article Johnny Appleseed; it is used under the Creative Commons Attribution-ShareAlike 3.0 Unported License (CC-BY-SA). You may redistribute it, verbatim or modified, providing that you comply with the terms of the CC-BY-SA.